A double top is a trend reversal pattern that happens when a bull market comes to an end. Likewise a double bottom is a pattern commonly seen when a bear market comes to an end. They are also called “M” and “W” patterns because of their shape. See the diagram below. These chart patterns form during the brief period of uncertainty as a trend turns course. For example when a currency is in a bull trend that’s “topping out”, the first downward correction pulls in more buyers. This provides enough momentum to move the price back up. This creates the second top in the pattern. If more buyers don’t come in, the market falls back and a reversal gathers momentum. Trends often finish up by displaying this kind of a double or even triple pattern. Breaking down the pattern: A double top is simply a retest of a resistance line. Though the “double retest” happens so often that it’s given its own name. Likewise, the double bottom is a retest of a support line. See Figure 1. To be valid the double top pattern should stand on its own as the two highest peaks in the nearby trend. The pattern usually forms as the last group of buyers comes into the market. The price will often accelerate towards the peak but on rising volatility (see the ATR to confirm) and decreasing volume. If the market is moving sideways and is making gradually higher highs, this isn’t a double top. Likewise the double bottom should clearly mark a deep trough in the trend you are looking at. As with all technical patterns when you see it in a real forex chart it will rarely be neat and symmetrical like the diagrams. The tops might not be perfectly horizontal and it might not be symmetrical. This isn’t important. It’s the basic properties that matter. 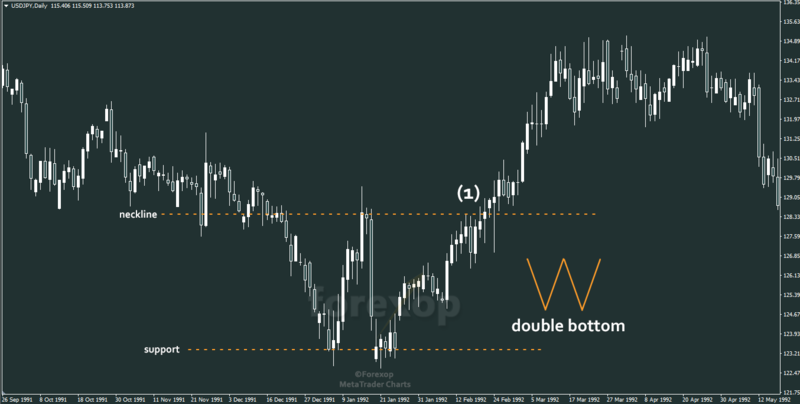 The double top and double bottom pattern only completes when the price has broken through the neckline. This increases the probability that the market is reversing and not simply trending sideways. If the price rises again and starts to trend sideways it could be forming into a flag pattern. That could be a strong sign of a continuation rather than reversal. In a double top, some traders will sell as soon as the price dips for a second time. That is, shortly after the price rebounds and the second top forms. This is higher risk, but potentially higher reward. It’s less risky to place the sell order after the price has fallen below the neckline support. This support then becomes resistance. Together with the upper line this mean there are two resistances above the current price level that would have to break if the trend were to resume upwards. It’s no guarantee but it provides some confirmation that the trend is indeed changing direction. In Figure 2, we sell at point (1) after the support line is broken. Some traders wait even longer, anticipating at least one retest of the neckline. You can place stops at distance about half to one and a half the distance between the support/resistance lines. There are pros and cons to placing your stop loss higher. Keep in mind you’ll see raised volatility around these patterns. At the top/bottom of a major trend you’ll normally see whipsaw price-movements that will trigger stop losses that are too tight. In this example the market does rally back up. The price breaks up through the neckline again. But it descends back without reaching the higher resistance line. 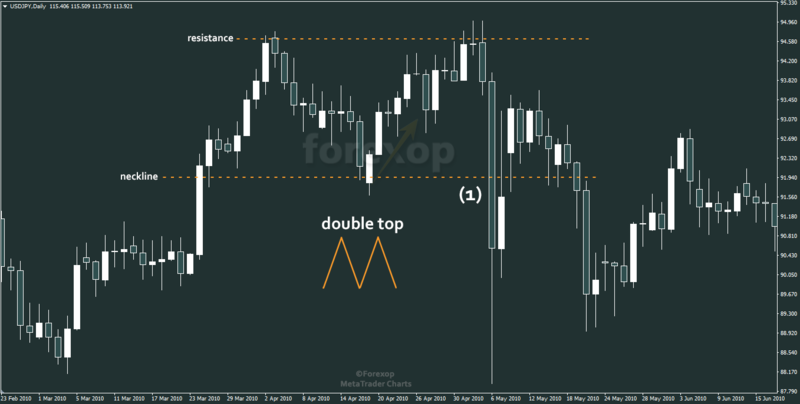 In a double bottom, we buy only when the price moves above the neckline resistance level. Again this is no guarantee. But it does reduce the chance of being caught on the wrong side of the market. In Figure 3, we enter the market with a buy order at the point marked (1). Again the stop loss is placed at a distance between one and one and a half-times the gap between the support/resistance. A lower stop can be used when you’re more confident of a reversal. You can use a support resistance indicator to help locate probable pivot lines. These will help in setting profit targets too. In this example the market doesn’t make a clean break of the neckline. It tests the resistance and rebounds the first time. On the second attempt it makes a strong break and the trend clearly reverses and turns bullish. Double top breakouts happen when the reversal fails and an upside breakout happens. That is, the pattern is not a reversal but a continuation. These formations resemble flags and rectangular ranges so it’s difficult to tell one from another. Contrarian traders look for these as opportunities to bet against the crowd. 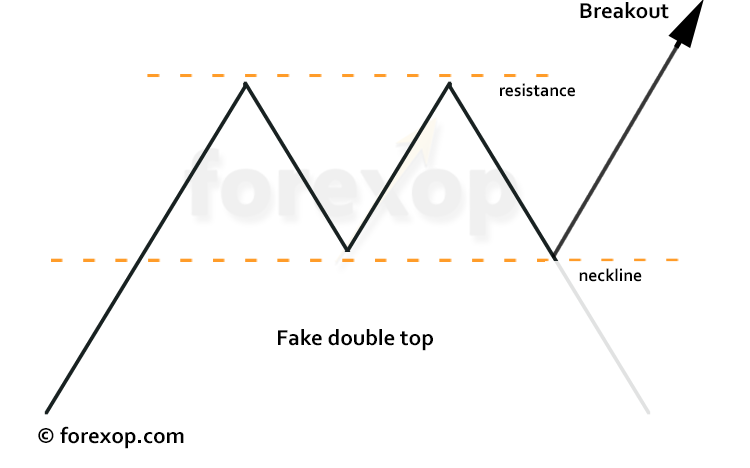 When a double top breakout happens, the price may touch the neckline and then rebound. Or it may break down through the neckline and then reverse back up. See Figure 4. To avoid trading these cases it helps to look for other signs that the trend is exhausting. Before placing the trade we ensure the pattern is forming at a noticeable peak and there haven’t been any recent pullbacks in the trend. The double bottom breakout is just the other way around – it forms in a down trend.